Cornish Pasties are a meal in a crust. These 6" ones are perfect lunch or buffet sized. For a dinner serving most adults would probably eat two! Serve with a green salad, sliced tomatoes, pickled onion and a chunk of sharp Cheddar cheese for authentic "Pub Grub". My pricing is based on the following shopping. Prep time close to an hour. Cooking time 35 minutes. 8 oz of lean beef fillet mignon, NY Strip, sirloin suggested or substitute lean ground beef. Will make 16 6” circumference pasties. Let the pastry thaw out of the package for a few minutes or until you can unfold the sheets without breaking them. (If they do tear or break…use a little water to re seal the cracks) On a well floured surface roll into a square approximately 13” x 13”. Any thinner and it will not have the body to support the filling. 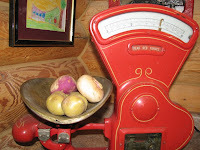 Keep the pastry chilled while you slice the potatoes turnip and onion into similar size pieces. 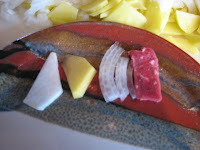 Slice the beef into thin slices roughly same size as the vegetable slices. If the meat is slightly frozen it will be easier to slice. In a large bowl mix the meat and vegetables. Season with the salt, pepper, thyme, mustard , sauce. Mixture should NOT be sloppy. 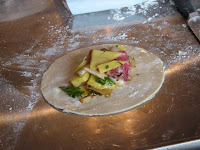 At this stage you can freeze the pasties unwrapped and when frozen wrap and label. Brush pasties with milk or cold water. Bake at 450F for 10 minutes. Reduce heat to 350 and bake a further 35 minutes. This time is for the 6” pasties. For larger pasties increase the time baked at 350 by 10 minutes. Brush pasties with milk or cold water. Bake at 450F for 10 minutes. Reduce heat to 350F. and bake 25 more minutes. *Obviously the most expensive ingredient. I've found the Pepperidge Farm brand ranging from $3.95 to $6.25. A lot of the organic type grocery stores and ethnic stores sell puff pastry packs for as little as $2.19 a pound. Or of course you can make your own. It really isn't difficult, just time consuming. 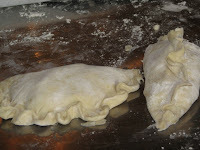 ** Two schools of thought on how the pasties should be crimped - folded over or pulled up on top. Those who thnk they know say the side crimp is Devonshire and the top crimp Cornish. I haven't a clue and vary how I fold and crimp. Top one probably looks prettier. 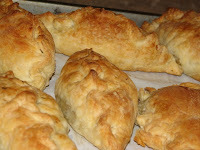 Baked pasties can be cooled , well wrapped and frozen. Do not thaw before re heating. 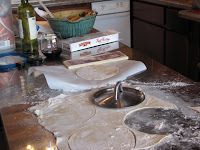 Put them in a 450F oven for 10 minutes to re-crisp the pastry or simply thaw and eat cold. Thanks for a great recipe and a thorough step by step process. We are based in the UK and we run a Cornish Pasty business, recently we've been on the lookout for Cornish Pasty recipes from the USA...we'll be running a feature called Cornish Pasty Across the Pond soon and we'd love to mention your post! Thanks once again! Thank you Cornish Pasty Girls, we're happy to promote this sublime food! Anything we can do to help, let us know. How about sharing the story behind your business with www.connectionsforwomen.com? Hi, I'm from Cornwall and I've been making pasties from childhood according to family recipes and this one really doesnt match up. Firstly, puff pastry is not traditional although many people think it is. Secondly, the addition of ketchup or brown sauce is a travesty. Thirdly have you tried dicing rather than slicing the ingredients? And finally, if you can get hold of beef skirt it is sublime. Minced beef should be avoided unless absolutely necessary. Thank you for commenting. Perhaps you would like to share your recipe. Mine has evolved out of years of adjustments to family taste etc. and I assure you that they are full of flavour, moist and yummy. I have tried dicing the meat and veggies - my kids, growing up, much preferred sliced and so that modification came into play. One of my college room mates back in the early sixties was 11 th. generation Cornish and it was her Mum who convinced me that puff/flaky pastry not only tasted wonderful but made for a spectacular presentation. Until I got lazy and bought puff pastry - I used her recipe. I think every traditional recipe adjusts with the times and situation. Ah, but puff pastry and flaky pastry are entirely different beasts! Lol. As for sharing a recipe; I will make sure to write one down next time I bake them; as I was taught to bake them by eye and thus have no measurements to give out. Not at all hostile - no offense taken. I do much of my cooking "by eye" and writing down directions etc. is major work. My daughter-in-law's Mom and I are embarking on putting together a family cook book(for family) this year and we've acknowledged that "a shake of this , dash of that, and pinch of the other" won't cut it. As for slow-cooking the pasties - might be elevation, might be extremely dry climate but I've found the fast method to work best for me of late. Yes - ketchup, a chunk of butter or dash of HP sauce is instead of gravy. I've also found that by slicing rather than dicing ingredients I get a more even baking process.